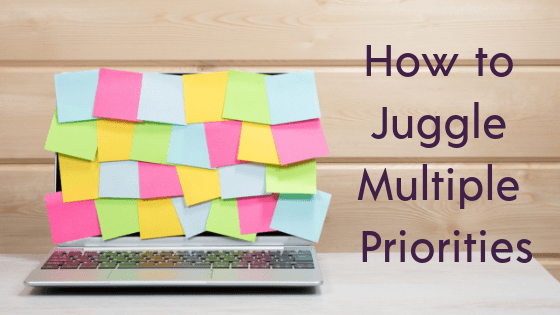 I am often asked how to juggle multiple priorities, especially when everything seems important. This is a struggle for many people so I thought I would share three quick steps to prioritize your workload. Get everything out of your head. Very often we feel overwhelmed by all that we have to do because it’s all floating around in our heads and there is no concrete plan for getting them done. Not having captured those tasks can make you feel that you have to try and remember everything. Reality is that we can’t remember everything so it’s very important to come up with a system for capturing your thoughts and tasks in an effective way. A very simple idea is to use a notebook or a Word document to capture all of your ideas and things to do. Get everything out of your head and on paper or in your Word document. You may not get all of your thoughts out during the first brain dump, but this gives you a good starting point. You can always go back and add tasks that you think of later. Prioritize your tasks. Very simply, you will now decide which of the tasks or group of tasks is most important. You can rank all of the others accordingly. Another idea is to choose 2 or 3 tasks per day to complete and prioritize among those. If you can’t decide which of the grouping is most important, just pick one and get started on it. Get to work! Now that you’ve captured all of your ideas and decided which is most important, it’s time to get started on the task. Focus is a key in this step. If you get interrupted, you can easily decide whether the interruption is more important than the task you’re currently working on.